The innovative tram-train service between Rotherham and Sheffield is certainly on the right track when it comes to passenger satisfaction. 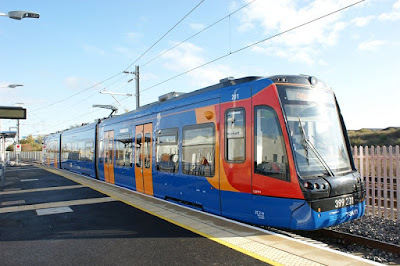 An independent survey by Transport Focus for operator, Stagecoach, has revealed that 100% of respondents are satisfied with the overall journey and journey time on the route which uses the heavy rail line from Meadowhall to Parkgate and the tram network in Sheffield. Passengers in South Yorkshire are the first in the country to benefit from the innovative pilot project, which entered public service at the end of October. Funded by the Government, the trial uses special vehicles and pioneering technology and aims to show how similar services can be introduced across the country. It has not been without its problems, from being late and over budget, to a derailment on the first day of services. This week services were suspended for a day due to a vehicle fault which led to the requirement for further checks to be carried out on other Citylink trams. For the first time the survey asked passengers on the new tram-train service for their views. Satisfaction with the overall journey and journey time on this route was 100%, and 92% were satisfied with the value for money. Tim Bilby, managing director at Stagecoach Supertram, said: "These survey results are a great endorsement of the commitment and hard work our people at Supertram put into delivering an excellent service for our customers. "We are particularly pleased that the survey supports our own findings that the new Tram Train service has been extremely popular with users, and it is providing a key new link in South Yorkshire's public transport network. "We offer high-quality, great value, fast, frequent and punctual tram services which connect easily to other modes of transport and it's great to see that our customers have recognised that. "People in Sheffield and Rotherham rightly take great pride in their tram network and we work hard every day to deliver the services that they rely on to access employment, education, health and leisure facilities. Along with SYPTE, we are also involved in helping to safeguard the tram network for many years to come through the on-going rail replacement project. However, we are not complacent and will continue to challenge ourselves to do even better." Tim Taylor, director of customer services at South Yorkshire Passenger Transport Executive (SYPTE), added: "Supertram is a popular travel option and it's great to have such a positive response to this survey, year-on-year. It's especially encouraging to note, while 41% of the most satisfied respondents have easy access to private transport, they choose to use the tram. We're also particularly pleased with passenger satisfaction on Tram Train services. "It's reassuring to receive such a good response after the short time services have been running. Together with Stagecoach, we're committed to continuing to make improvements and invest in the future of the network, for even better customer journeys." Was the survey before the latest problems with the service? In view of the difficulties, I am suspicious of the high satisfaction rate quoted. Also a lot of people are unhappy about the lack of a halt at Magna - which again makes the satisfaction rate a surprise.